Horn flies are common fly species associated with livestock. 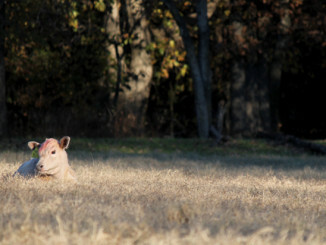 They are the most abundant biting flies present during the spring and summer months on cattle in Oklahoma. Horn flies are a small black fly with piercing/sucking mouthparts that feed on cattle in an inverted position with their head facing down. Male and female flies take blood from the host and feed 20 to 30 times a day. Horn flies continually stay on the animal and only leave the animal for short periods to lay eggs. Typical feeding areas on cattle include the back, side, belly and legs of cattle. Horn fly populations begin building up in the spring as early as April and last until the first frost. 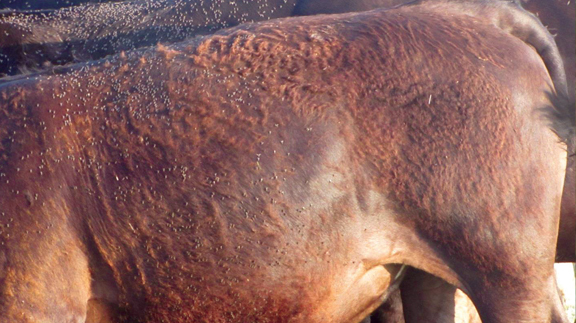 The life cycle of horn flies lends itself to building large populations on cattle, if control is not implemented. Horn flies complete an entire generation in as few as 14 days during the summer months, which leads to numerous generations of flies throughout the summer months. Horn flies have complete metamorphosis, which consists of egg, larva, pupae and adults. Pick up the May issue of OKFR to learn more about horn flies!